KUALA LUMPUR, 11 Dec 2013 – A study by The National University of Malaysia Medical Centre (UKMMC) has indicated that diabetes may be the most important risk factor that could lead to stroke attacks in Malaysia. The strong link between diabetes and stroke is of a major concern because of the steady increase in the number of Malaysians with diabetes, especially amongst the young, a consultant neurologist at UKMMC, Prof Datin Dr Norlinah Mohd Ibrahim said when releasing results of the study to UKM News Portal today. The study found the risk of getting a stroke attack due to diabetes to be much higher in the Malaysian population compared to elsewhere in the world where aging and hypertension were the most common risk factors for stroke. Diabetes usually takes the number three spot. It found 60% of stroke patients admitted to UKMMC over a four year period were diabetics. Of equal concern, 1 in 6 of the patients were only diagnosed with diabetes when they were admitted for stroke attacks. Prof Norlinah said the proportion of having diabetis among stroke patients is alarming as it is roughly three times the rate seen in other parts of the world, including in Asian countries that have a similar population to Malaysia. Though having diabetes was not a guarantee of developing a stroke attack but the study shows that diabetic patients are more likely to get a stroke attack compared to those who are not diabetic. Risk for the attack is even higher if a person have more than one risk factor, she said. “The most common type of stroke is referred to as an ischaemic stroke. This occurs when blood supply to the brain is disrupted by a blood clot in the vessel or thickening of the blood vessel wall”. Prof Norlinah said most cases of vessel wall thickening occur in small vessels called lacunar arteries. This phenomenon is usually seen in patients with high blood pressure. Surprisingly, the PPUKM data showed that this sort of stroke, also called lacunar stroke, was significantly associated with diabetes rather than hypertension though the association between diabetes and lacunar stroke is by no means new and has been described before, she said. “The traditionally held belief has always been that hypertension was the major contributor to lacunar infarcts but the study shows that diabetes appears to play a major role as well”. The UKMMC researchers also found an increasing number of younger patients (below 50) being admitted with stroke. They are mostly diabetic which again appears to be at odds with previously held beliefs about why stroke occurs in the young. 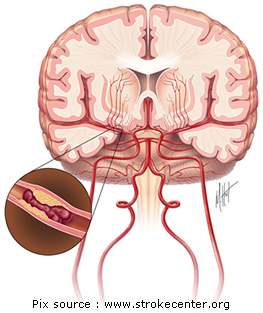 Prof Norlinah said it has always been the belief that stroke in the young occurred as a result of structural abnormalities of the heart like heart rhythm abnormality and blood clot formation, blood clotting disorders and other uncommon diseases. She advised everyone, especially those above 40 and with a family history of diabetes, to have an annual routine medical screening and practise a healthy lifestyle with regular exercises as a means of keeping diabetes at bay. Those with diabetes are also advised to maintain good glucose control by watching their diets, exercising and taking their prescribed medications. Periodic visits to their doctors are also essential, Prof Norlinah said. “A good understanding of the risk factors of getting a stroke is essential in trying to prevent a sharp increase in stroke patients in the coming years. We hope that our data will contribute to the local and global knowledge on why diagnosing and treating diabetes is such an important part in the fight against stroke,” she said.